to their apparent simplicity, granular materials pose many challenges to both experiment and theory. In theory, the energy loss at the collision of particles breaks time-reversal symmetry and leads to emerging effects such as cooling and cluster formation. In experiments, the energy loss leads to quick sedimentation on ground and motivates experiments in microgravity. 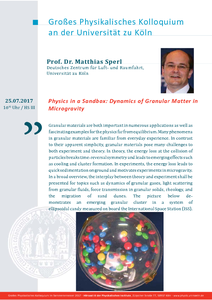 In a broad overview, the interplay between theory and experiment shall be presented for topics such as dynamics of granular gases, light scattering the migration of sand dunes.